It’s a chilly December day in Chicago. The Sacramento Kings are wrapping up their morning shootaround inside the United Center. Many of the players have retreated to the sidelines to get iced, check their phone notifications and collect their belongings. Others continue to get up some additional shots. 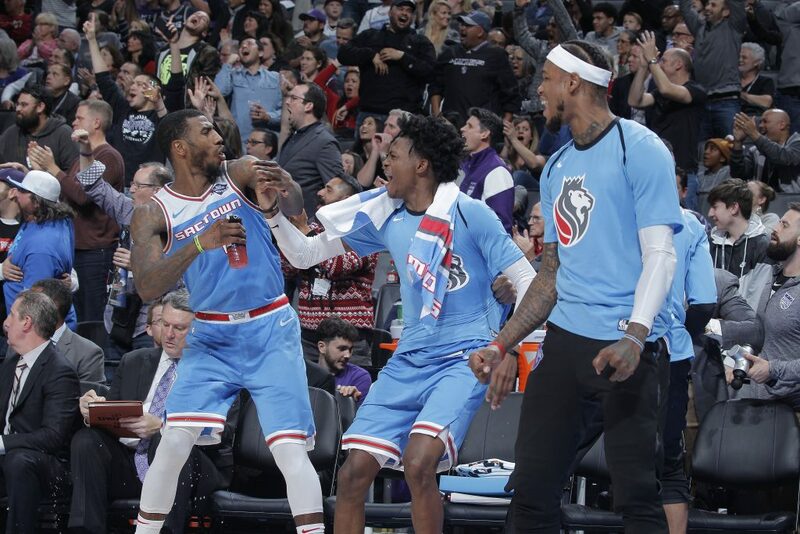 Seated on the sidelines and engaged in a conversation about open restaurant locations around the team’s hotel the night before, De’Aaron Fox catches sight of Iman Shumpert—who grew up 15 minutes away—launching 40-footers across from him. Assistant coach Bobby Jackson shags the misses and continues to feed passes as shot after shot ricochet off the backboard. Oblivious that Shumpert is trying to bank home a make, the point guard begins playfully taunting Shumpert, which directs most of the attention toward the court. 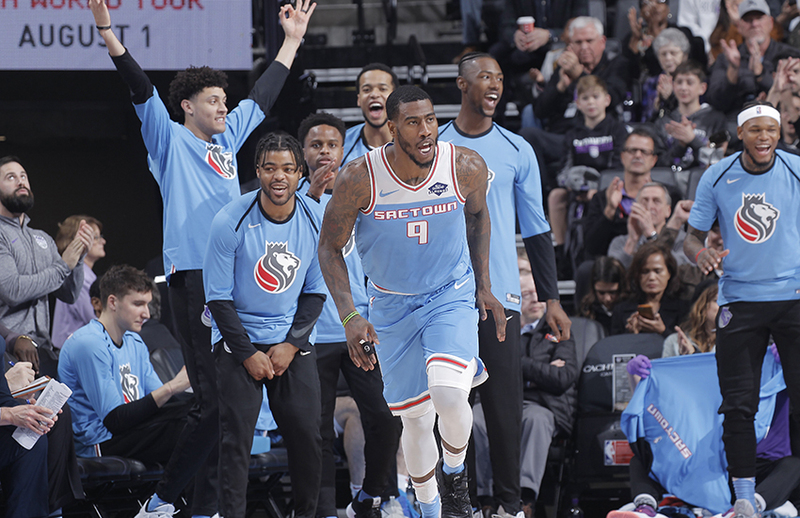 “Really, bro?” a smiling Shumpert shot back.When the Cleveland Cavaliers traded the eight-year guard last February, it was uncertain where he would fit within Sacramento’s youth movement, particularly in a backcourt that needed playing time for development. Shumpert was also coming off of knee surgery a couple of months prior to the deal and was looking for an opportunity to showcase his versatility with having been marginalized in Cleveland. It didn’t seem like a good fit for either party. Shumpert is not only getting his chance to show his value on the court, but he’s also become the voice of the locker room. His positive and playful nature has endeared him to his younger teammates. Coming from a culture in Cleveland that saw him play with the game’s best player and go to three straight NBA Finals—winning in 2016 in historic come-from-behind fashion—when he talks, he has each of his teammates attention; and he’s always talking. A quarter of the season has passed. Typically at this point, their record would be somewhere near the bottom of the Western Conference standings. Seemingly stuck in a continuous rebuilding effort, more of the same was expected. No one would have dared imagined the Kings would be within sniffing distance of the playoffs. But here they are, sitting above .500 and as one of the best surprises of the season. Joerger implemented a system that has the team playing at one of the fastest paces in the League, featuring an equal-opportunity attack that makes everyone on the floor a threat and keeps all engaged—an unlikely task on any young team with players vying to assert their place in the pecking order. Yeah, it’s still early in the season and the Kings are the current owners of the longest playoff drought for an NBA team (12 seasons and counting). But for a fan base that has endured the dysfunction the franchise has been mired in during that span, having a competitive team that’s fun to watch and enjoys playing with one another is cause for jubilation. Shumpert is a huge part of that. He never got the opportunity to suit up for the Kings last season and was limited to just 14 games. Like many times in his career, the injury bug stung him when things seemed to be coming together. The plantar fasciitis in his left heel had gotten so bad that he contemplated surgery to alleviate the pain that even begin affecting his sleep. He opted for alternative therapy to avoid going under the knife again, but there were times where he questioned would he ever get the chance to show all he could do. 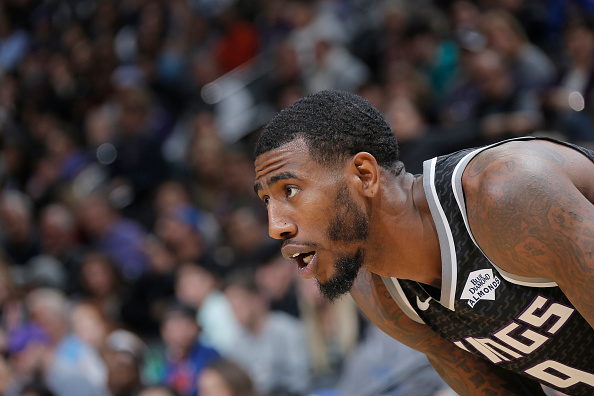 “I fell out of a lot of opportunities being injured,” says Shumpert, “It can put you into a bit of depression—doing all that work during the summer, still getting hurt, and basically erasing everything that you did for your body and then starting from scratch. It’s a frustration you deal with. He entered the summer fully healthy for the first time in a long time. He knew opportunities would be granted to him based on his defensive reputation alone. While that was established, he was anxious to fine-tune other elements of his game that had been shelved and collecting dust while in Cleveland. Shumpert sought out the help of noted skills trainer Chris Johnson in Los Angeles. Names like, Jimmy Butler, Tobias Harris and Rajon Rondo have all worked under the guidance of Johnson. During an introductory dinner, Johnson discussed simplifying his new client’s training regimen and also the way he looked at the game. 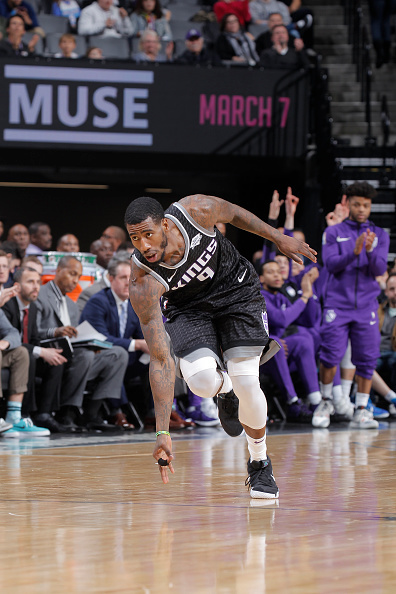 The prime areas of focus was Shumpert’s mid-post, his decision-making in the pick-and-roll and his finishing around the basket. From June until training camp neared, Shumpert dedicated himself to the program. Results of the progress he made were on display during highlights from open run sessions set up by Johnson for his clients and other pros, which were posted on his Instagram page. As much as Shumpert gained from his time working with Johnson, it was vice versa for the trainer. Before meeting and getting to know him, Johnson knew what his clients strengths and weaknesses were on the court, but he didn’t know the person. He saw the music videos, a multitalented and famous wife and a reality show that made them to epitome of many #relationshipgoals. “I had preconceived notions that Iman had an aura about himself,” says Johnson. “I couldn’t quite put my finger on what it was. Was it conceitedness or arrogance?” It was neither. “He’s not a Hollywood guy,” he says. “He’s a Chicago kid—right there in Oak Park. I seen how he takes care of his people, the love he has for his daughter and wife. I got a firsthand experience on how genuine he is. Shumpert returned to training camp with a renewed confidence, and even more swagger—if that’s possible for the confident Shumpert—which immediately rubbed off on his teammates. It didn’t take long for him to dub the team “The Scores,” as a play on the fact that anyone on the floor could have a big game on any given night. He also begin talking not getting close to the playoffs, but making them. This could’ve have been viewed as crazy talk, especially for a team that hasn’t won more than 33 games in the past 10 seasons. But his teammates bought into his message and begin believing they were as dangerous as any other team in the West. 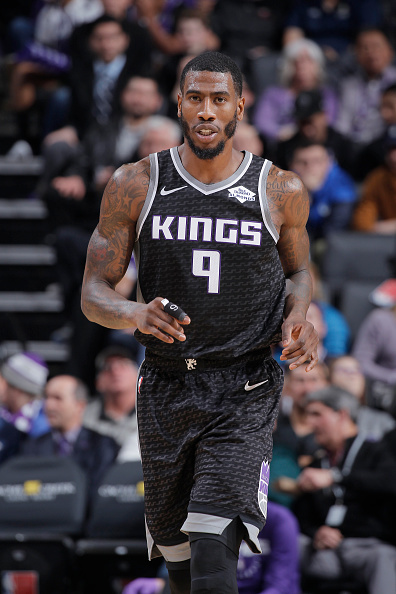 While he won’t and can’t take all the credit for the turnaround, it’s clear that the Kings are better off having acquired Shumpert than they were before they did. Gathering another pass from Jackson, Shumpert takes one dribble and launches another attempt with this one finding the bottom of the net. After turning around to grab his speaker and coat, he takes a seat and turns his attention to Fox as teammates and coaches are having a laugh at what just transpired. “Did that hit the rim?” He shot back, repeating the question until Fox —unable to think of a playful retort — continues to gather his belongings and join his teammates and coaches on the walk towards the team bus. Whether they make the postseason or not, the foundation has been laid for more completive future. For the first time in a long time for the Kings, there is a joy in playing the game again. They go into games expecting to win. They play for one another and have given the fan base a reason to fill the Golden 1 Center regardless of who the opponent is. If you don’t like that, you don’t like Sacramento Kings basketball.